As we were leaving the Seattle Premium Outlets, we briefly entertained the thought of either eating in Burlington or Bellingham. However, we were on the lookout for Japanese food since the previous 2 days, we had some pretty heavy stuff. Well, it was a short deliberation. We decided to head back into the GVRD for Japanese food. Not a difficult decision really. Initially, we thought that by virtue of having NEXUS, we'd make it across the border in no time. Well, that would be the case if the NEXUS lane was not blocked by the regular lineup. Why offer NEXUS when people can't even get into the lane? Or better yet, why were people blocking the lane??? This was at the Pacific Border crossing. We hightailed along D Street to the Peace Arch and yup, the lane was blocked as well. At least the people blocking the lane were legitimately trying to head into the regular lanes. Such was not the case at the Pacific Border. So once across, we were starving as it was past 8:30pm. 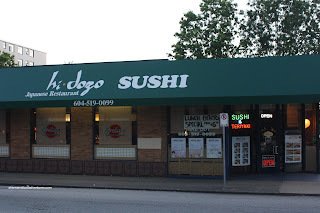 With very little creativity, we headed over to Hi, Dozo Sushi in New West. I remembered about this place when we dined at Tamarind Hill across the street last year. For those who care, the place is Korean-owned. We don't really care because good food is good food, no matter who makes it. 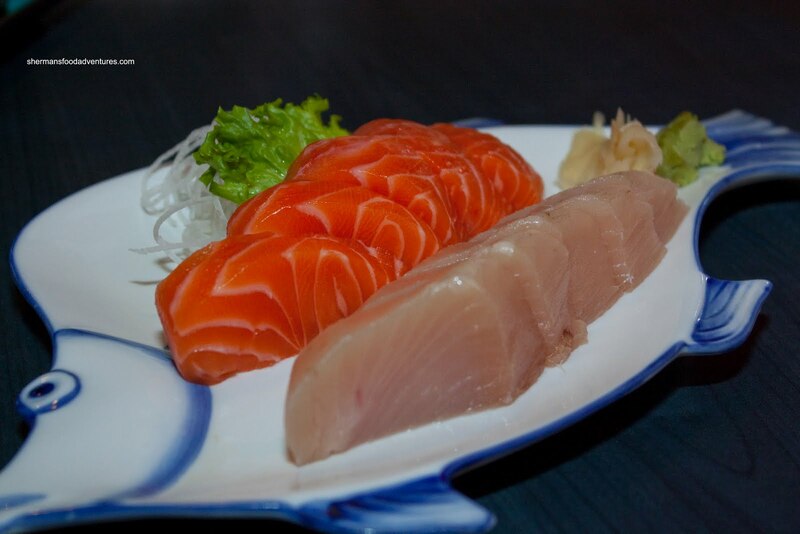 We started off with an order of Tuna & Salmon Sashimi. Appearance-wise, the sashimi looked fantastic. Tastewise, it wasn't as flavourful as it looked; yet it was still good. Textures were right on and it was fresh (as fresh as previously frozen can get). The one thing that bugged me was the tuna, the pieces got progressively smaller as you can see in the picture. 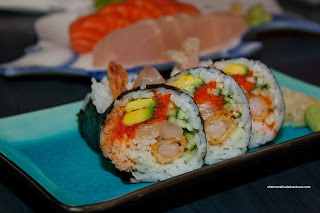 For our token maki sushi, we got the House Roll consisting of ebi tempura, cucumber, avocado, tobiko, imitation crab and tuna. The roll was done right as it stayed together when we picked it with our chopsticks while not being stiff. I liked how the ebi tempura was still crispy. The sushi rice was acceptable being somewhere in between chewy and dry. 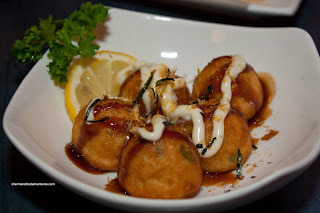 For some reason or another, I decided to go for an order of the Takoyaki. I'm pretty sure these were pre-made and then deep-fried. Normally, they should be made fresh and then placed in a mold and pan-grilled. No matter though, these were still good, fluffy in the middle and crisp on the outside. There was the right amount of sauce and mayo; yet I would've liked more bonito flakes though. As always, when my son is around, he wants Tempura. And just like always, he only eats the batter. Well, the batter was crispy and not all that oily. 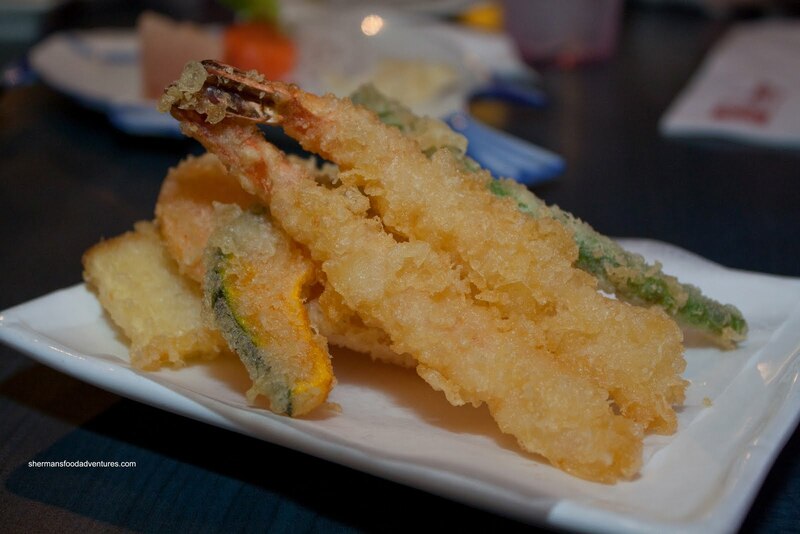 Each piece of vegetable was fresh while the ebi had a nice cold-water texture. 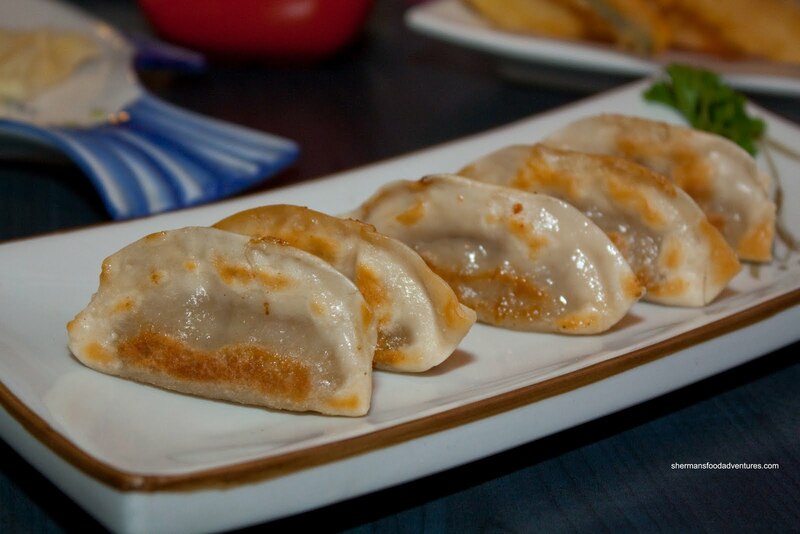 I don't know about you; but I'm not a huge fan of pan-frying Gyoza on all sides uniformly. I believe, much like the potsticker, needs to be browned on the bottom. The rest should look and eat like a steamed dumpling. So I was indifferent towards the ones we got here. With all surfaces browned, it became almost more like a fried gyoza in texture and oiliness. The gyoza itself was okay. Too bad they had to cook it this way. 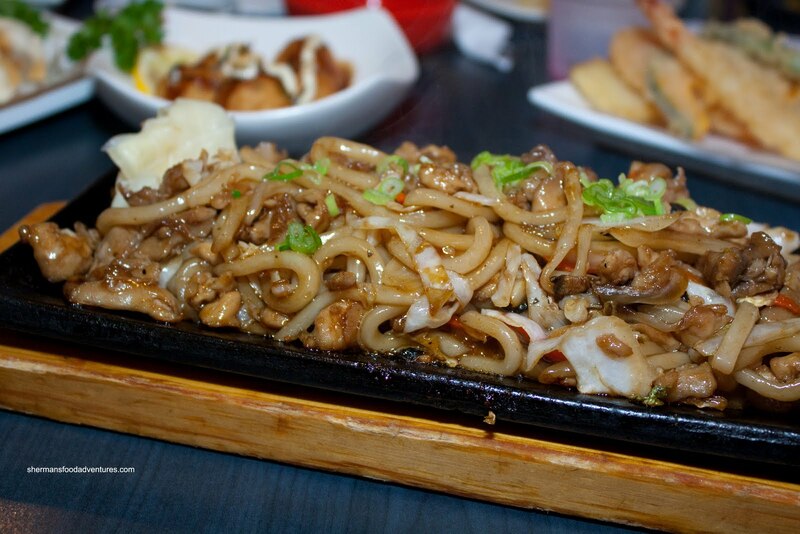 Lastly, we got an order of the Chicken Yaki Udon. This is the 3rd time we've ordered this dish in the last 2 weeks. My son seemed to take a liking to it, so we figured it was a good idea to run with it. The yaki udon arrived on a sizzling hot plate that was long and quite narrow. Therefore, not much in the way of noodles could fit onto the small surface area. We found the noodles slightly soft, especially when we tried to pick it up with our chopsticks. With the udon sticking to the hot plate, we were only able to get small strands as they broke off very easily. It also didn't help that there was too much sauce as well, which only served to soften the noodles more. Looking past some of the food issues, the meal was actually quite decent. Furthermore, the staff were very friendly. However, we felt that the prices were slightly high for the amount of food on the plate. All-in-all, Hi, Dozo is very similar to many of the other Japanese restaurants in New West: it does the job given its location. Hmm, we've never been blocked by non-Nexus traffic when we go through the Nexus lane, at either crossing. And how do they block Nexus lane when on SR543, it's marked and delineated from H Street !